The records of the National Domestic Workers Union (NDWU) have been digitized by Gale/Cengage Learning and made available through their Archives Unbound database. Gale, “a world leader in e-research and educational publishing for libraries, schools and businesses,” approached the Southern Labor Archives about the collection, arranged for it to be digitized, and will host the collection on Archives Unbound for the next five years. As part of this agreement, the Georgia State University community has access to the digitized collection online, both on and off-campus (Campus ID and Password are needed to access the collection from off-campus) and it will be available to any institution subscribed to the Archives Unbound database. 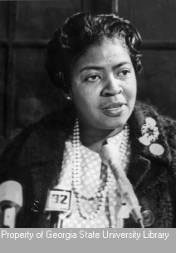 The National Domestic Workers Union (NDWU) was founded in Atlanta in 1968 by Dorothy Bolden to help women engaged in household work. 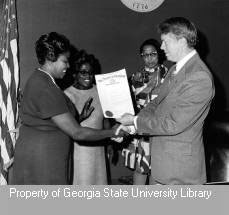 The records of the NDWU, 1965-1979, provide insight into Bolden’s efforts to organize household workers and the union’s involvement in Atlanta’s black community through programs such as the Manpower Program, the Career Learning Center, the Homemaking Skills Training Program, Maids Honor Day, and others sponsored by government agencies. Governor Jimmy Carter presents Bolden with a proclamation. The records contain correspondence, legal and financial documents, minutes, printed material, and photographs. Among the correspondents are Julian Bond, Sam Nunn, Herman Talmadge, Andrew Young, and other Georgia and national political figures. The records also contain information about some of the organizations in which Bolden participated, such as the Citizen’s Advisory Committee on Transportation, the Secretary’s Advisory Committee on the Rights and Responsibilities of Women, WIGO radio station, and Metropolitan Atlanta Rapid Transit Authority (MARTA). Gale/Cengage Learning has also digitized selected portions of the United Garment Workers of America records, which will be available through Archives Unbound later this year. Hamilton Nolan. “Domestic Workers Need a Union.” Gawker. February 28, 2013. Tala Dowlatshahi. “Domestic Workers: Long Hours, Backbreaking Jobs and Few Rights.” Huffington Post. February 28, 2013. Bryce Covert. “Why Are Domestic Workers Ignored in Immigration Reform?” The Nation (blog). February 28, 2013. Bryce Covert. “How to Include Domestic Workers in Immigration Reform.” The Nation (blog). February 28, 2013. This entry was posted in African American Studies, Digital Collections, Economics, For Faculty, For Graduate Students, For Students, History, Primary Resources, Sociology, Special Collections & Archives, Women's, Gender, and Sexuality Studies. Bookmark the permalink.